TechheroX - Cybersecurity d3c0ded for the European Data Protection Regulation. All you need is a DPO. A Data Protection Law. GDPR/2016. A shield for data protection. Article 39 requires almost every public and private institution to have a “Data Protection Officer”, who may be a staff member or fulfil its tasks on the basis of a service contract. This professional is akin to the position of the “Master of Arms”, remember? The Master of Arms was not only responsible of the Castle safety, but also of training the population living within the castle to defend it in case of attack. Just as the “Master of Arms” could not fence by himself, “Data Protection Officers” neither can. Particularly when 90% of successful cyberattacks are due to human errors or negligence that could have been avoided. How? Simple: Training and Awareness. Additionally, we focus on storytelling as the most efficient way to convey contents. Explaining that eBay data bases were the target of a phishing attack that could be thwarted thanks to an encryption technology called Hashing is not as effective as listening to a podcast where we recreate the absolutely desperate conversation of eBay's CEO with the company’s communications manager on the day of the attack. Soledad Antelada Toledano is in charge of the academic supervision of all contents. Soledad is a Cybersecurity Engineer at U.S. Lawrence Berkeley National Laboratory. She has been named among the 20 most influential Latinos in Silicon Valley. It integrates awareness and training into data procedures and data processing, in accordance with the European Regulation, and promotes the generation of habits to avoid security breaches, espionage, identity fraud, credential theft, etc. Who cares for your data? We start by raising awareness among each company’s employees that they are the first line of defence for their company’s security. This is something they are completely unaware of nowadays. In this episode we basically teach them how not to take the bait, how not to trust any suspicious e-mail, at all levels, from the most basic e-mails that go directly to the Spam folder, to e-mails impersonating the identity of real persons. From the data protection perspective, phishing may represent a security breach, and the DPO has the primary responsibility for preventing and solving it. The DPO is a recently introduced figure in the Spanish laws, and all employees should be aware of its existence in order to know who they shall report to. Employees should also be aware of the sanctions and reputational damage companies may incur if this kind of incidents are poorly managed. This episode shows that hacking has a lot more to do with psychology than with technology. Social engineering uses data to “do evil”, and we need to know how to appropriately process data to avoid incurring in non-compliance. Additionally, we explain the data controller and processor rights that anyone working with personal data shall know and also the data subject rights, in order to ensure these can be adequately exercised. What is the connection between Carbanak, the greatest cyber-band in history, and the Protection of computers, tablets and mobile phones? This episode explains how to avoid your hardware being tampered with; to this end we present the testimonial from hackers who have, obviously, remained anonymous. Or are they fictional? Hardware and devices transmit, store and send information and personal data that should be protected by the application of the security measures detailed in the European Data Protection Regulation. In this episode, employees learn about the procedure to be followed for the application of those measures. In this episode we use Greek mythology to identify which is, like the heel for Achilles, the weakest point in the on-line world, where and why employees are more vulnerable. And how they should protect themselves. Software contains, transmit and store data. If those data are accessed or deleted or if there is any other incident relating to computer systems, companies are required to give notice thereof to the Spanish Data Protection Agency. Accordingly, all employees of data processing companies should know the procedure to be followed in these cases. Protecting Communications, Social Media and Mobile Devices! Picture yourself about to board a plane, you may want to take a last look at the proposal you will present in China. To do that, you connect to the usual public Internet service. If the wi-fi network you have connected to is not a secure network, your wonderful and, most of all, extremely confidential presentation may end up in the hands of your competitors. That would not be good, would it? And any other company interested in protecting its own information. Our licence includes notifications with new contents and the latest trends. Cybercrime evolves very rapidly. Certificate of completion with Blockchain technology, powered by Smart Degrees. Invulnerable, transparent and permanent over time. 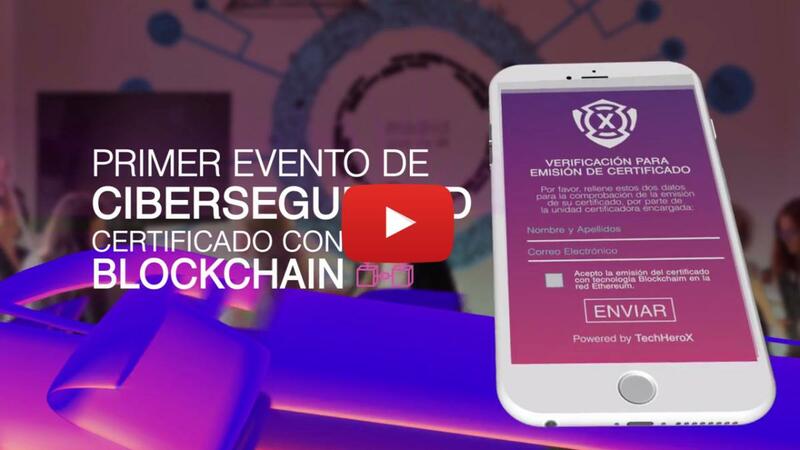 In June 2018 we organised, together with GirlsCanHack and MujeresTech, the 1st Summit of D3c0ded Cybersecurity for data protection, the first Cybersecurity event certified using blockchain technology. Natalia Martos, CEO & Founder Legal Army, legal leader in privacy and cybersecurity, expert in GDPR and recognised by Legal500 as one of the 70 top legal counsels. Soledad Antelada, head of the Cybersecurity department at LBNL, the renowned science research centre of the United States Government, based in Berkeley, and recognised in the US as one of the 20 most influential Latinos in the technological world. Cristina Aranda, PhD, a reference in Spain for women and technology matters. Founder of Mujeres Tech, Chief Marketing Officer at Intelygenz and Social Innovation Fellow at Meridian Intl. Center and the US Embassy in Madrid. Cristina is passionate of linguistics applied to marketing and technology, and develops projects where artificial intelligence is applied to chatbots in order to improve users experience. We explained 10 or more reasons why GDPR and CYBERSECURITY are the current trending pair, and why they should be the special guests of your company.